The Jackson Building received a $327,000 addition at the rear along Slater in 1941 for the RCAF. Image: geoOttawa. 1941 Ottawa was Wartime Ottawa. Of the top five building permits issued that year, four were issued to the Dominion Government to accommodate the expansion is wartime bureaucracy, and of those four, three were for the wooden so-called wartime “temporary” buildings. The wartime temporaries on Carling, at Preston. Image: geoOttawa. The wartime temporaries on Wellington, at Lyon. Image: geoOttawa. 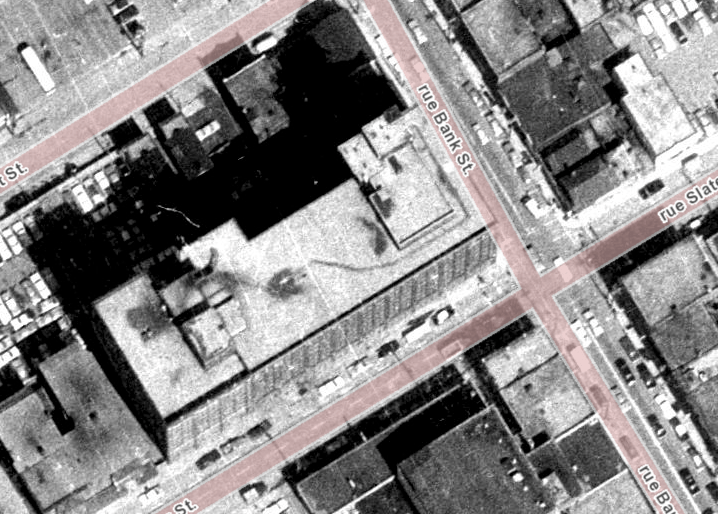 The other major Dominion project issued a permit that year was the $327,000 addition to the rear of the Jackson Building, which had been recently expropriated for use at the RCAF’s Headquarters, to house additional offices.1Although Ottawans were entirely on board with the war effort, the expropriations and wartime office construction did provoke some anxiety. See “Spent $4,091,565 On Gov’t Buildings Last Fiscal Year,” Ottawa Journal, February 5, 1944, p. 12; “War Buildings in Ottawa Threaten Encirclement of Capital,” Ottawa Journal, August 8, 1942, p. 12; “Why Needed?” (Letter to the Editor), Ottawa Journal, August 25, 1942, p. 10. The Jackson Building (and its 1943/44 annex) has had an interesting life, which is well-covered by Robert Smythe, Charles Akben-Marchand, and even a little by myself. 1. ↥ Although Ottawans were entirely on board with the war effort, the expropriations and wartime office construction did provoke some anxiety. See “Spent $4,091,565 On Gov’t Buildings Last Fiscal Year,” Ottawa Journal, February 5, 1944, p. 12; “War Buildings in Ottawa Threaten Encirclement of Capital,” Ottawa Journal, August 8, 1942, p. 12; “Why Needed?” (Letter to the Editor), Ottawa Journal, August 25, 1942, p. 10.